Need to divvy up that dinner bill between five people or track expenses on a weeklong business trip? Sure, you can pop open the calculator app that comes with your smartphone to do the math. You can even jot down those amounts in your notepad app to remind you what you’re owed in case your cash-strapped friends are only packing plastic. But if you want to skip all of that and let technology do the work, you could pick up a dedicated program that divides up the bill and adds in the tip with just a few taps. 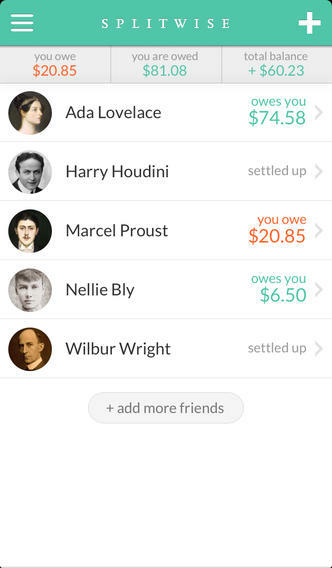 These check-splitting apps range from the supremely simple to the more calculatingly complex. Translation: There’s something for everyone out there—like these five standouts. The name of this free app perfectly describes its function: It adds in the tip on the dinner bill and then splits the total evenly between everyone sharing in the meal. The Tip N Split Calculator interface is frills-free—just tap in the sum on the check, the tip percentage and the number of people dividing up the total cost. You can also tap the calculator icon to open a full-screen calc for other minor math chores. The one downside? The app doesn’t offer a built-in function for splitting the check unevenly. Unlike some apps that just divide the check evenly, Billr takes into account every item ordered by each person around the table (it can handle up to 16 diners), so individual tabs can be tallied. The app can also factor group expenses into each person’s total—like that bottle of robust Malbec that everyone enjoyed. As you tap through the screens, you can add in the amount of tax on the meal, and pick the tip percentage you deem worthy. Once the check has been split, you can pass the phone around the table for each person to cough up the cash—or put the whole meal on your card, and send your pals a customized bill by text or e-mail. 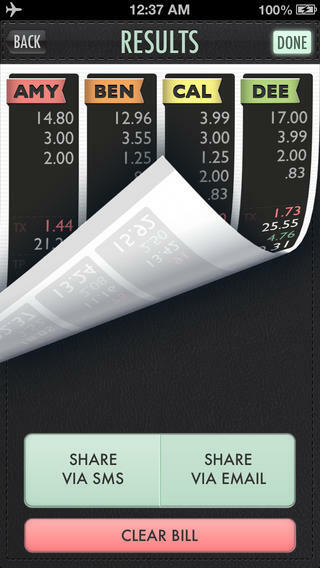 Bonus tip: The free Advanced Bill Splitter app offers many of the same functions for Android-based phones. The free Splitwise service slices up the dinner bill so everyone pays up properly, but this all-purpose cost-divider can do even more—it also tracks shared household and travel expenses. 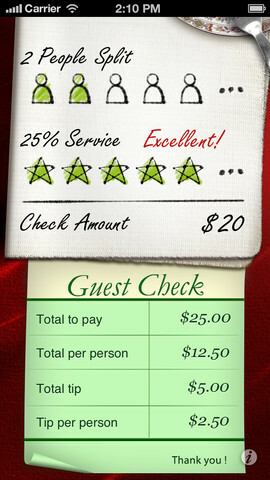 The uncluttered interface is simple to use, and the app can email receipts to your companions. Downside: You need an online account to use it, and the service works best when pals also have accounts—which may be more effort than it’s worth if you’re just looking to carve up a bar bill once a month. Designed with group expenses in mind, Receipt Ninja lets you create events (like business trips) and enter in the associated costs for food, transportation, hotel and other on-the-road expenditures. You can note the cost in U.S. dollars or other currencies, add people with whom you are evenly (or unevenly) dividing a bill, and tap a button to see reports of just how much was spent in each category. Bonus features include the ability to snap pictures of checks and bills to keep on file, and the option to share your cost analysis with companions by e-mail, text and even Dropbox or Google Drive cloud storage. Although Receipt Ninja is a powerful cost-tracker, there is one caveat: It’s not the most intuitive, so expect to do a lot of tapping. 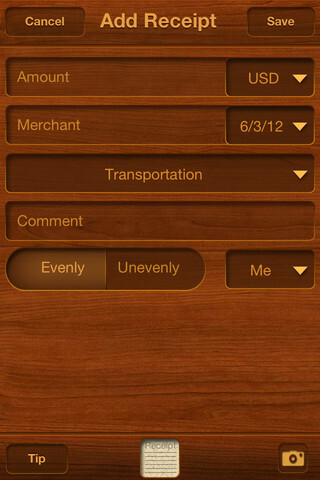 This inventive app uses the camera in the iPhone (or 5th-generation iPod Touch) to snap a picture of the check. 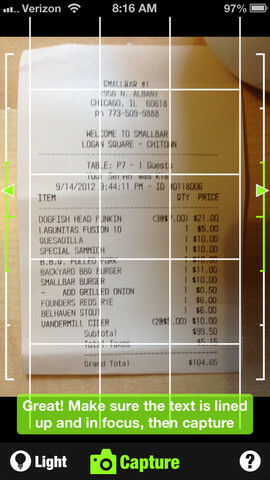 Once Divvy has a photo to work with, it uses its optical-character recognition software to scan and highlight each item on the bill. Instead of tapping in amounts with your finger, you use it to drag each scanned item on the check to the side of the screen and then drop it onto an icon for every dinner companion. Divvy then adds up each individual’s share, including the tax and tip amounts of your choice. If you can get the hang of the ol’ snap-and-drag routine, splitting the check is quick and easy. On the downside, Divvy only works on printed restaurant checks, and it needs to run on an iPhone 4 or newer model. The Great Allowance App Test Drive: Which One Did We Like?